The start of a new year always feels like a clean slate, a chance to start over, do more or be better. I do have some goals I'd like to achieve in 2019, and I definitely think that staying organized plays a large part in helping me stick to my plans! I thought it'd be fun to quickly share what tools I'll be using to stay on top of things in 2019, whether in my personal, bookish or online life. While I won't go into too many specifics here, if you're interested in learning more about anything, feel free to leave a comment or to reach out to me directly. Budget spreadsheet | My sister Mel deserves the credit for the spreadsheet you'll see a bit of in the screenshot above! She's always been the one with the interest in budgeting and creating something she could use to track her spending, and it's with her as my inspiration in mind that I've decided to utilize the budget sheet she was kind enough to share. There's a great overview that includes an overall look at my financial situation, as well as category breakdowns so that I can figure out what I'm spending most of my money on. For the first time ever, I'm eager to fill in this sheet! Is this a sign that I'm starting to be a proper adult? TBR spreadsheet | While I appreciate it very detailed sheets to keep track of things (as you'll see in a moment), I actually decided it was in my best interest to keep my personal TBR version as simple as possible. The books are split up by categories in each tab, but otherwise, all sheets have the same basic data: title, author, series, publisher and, in the case of review titles, publication date. The first tab contains a numerical summary so that I can get a general idea of how many books I've got left. Goodreads | I've been a Goodreads user for some time now, and it's still the option I gravitate towards when I want to organize my books. I keep track of what I've read in a year, what I need to review or purchase, or what I want to check out. In addition to my usual shelves, I've decided to track my challenges by creating specific shelves for that exact purpose! Editorial Calendar | Inspired by Rachel from Hello, Chelly, I've maintained an online calendar on Google Drive in order to keep track of what I plan to post and what I've already posted in a given month. It helps me when I'm trying to figure out when I can post collaborations or blog tours, try to get ahead when I've got a bit more time on my hands and can also help me easily rearrange things. Wunderlist | I've been using Wunderlist for a while now as well, and it's my preferred method for keeping track of my collaborations with Rachel. We keep joint lists for certain blog features we do together, and it's quite simple to update those lists, switch the entries around or add to them. Happy Planner | I briefly used this type of planner for a while before I stopped, as the one I had (a Mini Happy Planner) wasn't working for my purposes any longer. Cut to around August of 2018, when Hannah from So Obsessed With got me intrigued enough to start using Happy Notes - and I was hooked again. It's taken a couple of months, but I've finally figured out how I want to combine a Classic Happy Planner layout with my Happy Notes layout into one planner (which they call Franken-planning). I use the Happy Planner monthly portion for personal tasks, events and lists, and I'm using the Happy Notes dot grid pages for tracking my bookish stuff. I'm really excited to have set it up already and can't wait to use it for the rest of the year! How are you staying organized in 2019? Woo! I love seeing everyone's organization technique. It inspires me to get my sh*t together and organize myself better for the new year. I've gotten a lot better re: organization considering I used to be a mess but I am definitely going to try harder this year. Thanks for sharing! I am going to try to keep track of my budget this year as well. Or that was the plan, I bought a book, I think it's called Kakebo, and I haven't opened it and started it yet. Oops. I should try a spreadsheet. I went to check out the spreadsheet you use for your books, will try that! I also like your idea of making a shelf on Goodreads for the challenges! I need to do that to help myself. I have a great planner I use for my blog that I love, and it has refillable pages each year so that I can keep it going. Good luck with your year, and thanks for all the tips I got out of this one! Thank you for sharing your editorial calendar with me! I'm so excited to start using it!!! I have Trello boards at the moment which works wonders for keeping track of ideas but when it comes to actually posting, I love seeing it laid out in calendar form! THANK YOU!!!! 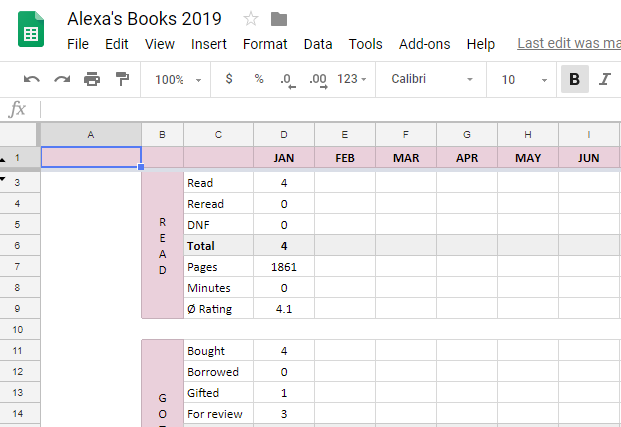 I'm using a spreadsheet (that Alexa from Library of Alexa made) to track my reading this year for the first time! I love seeing the stats change (my average rating, the percentage of books I read that are my own, etc.) so it has motivated me to read more every day. I'm a pen and paper gal, so I keep a calendar in my bullet journal! But I'm not *too* organized about it, haha. I keep a bunch of lists in Google Docs, like post ideas, that I revisit from time to time. And I love using a composition notebook everyday to write my to-do lists! I don't have to keep it neat, which was the thing that always kept me away from actually using my planner. I never wanted to write in it!